The 150,000 BTU Natural Gas Above Ground Heater By Raypak Is A Top Choice! The Raypak 150,000 BTU Natural Gas Above Ground Pool Heater is the perfect choice for larger above-ground pools, spas and inground pools. The 156 has up to 50 more BTUs than competitor above-ground pool heaters. More BTUs means quicker, longer-lasting heat-up. With this heater, you can extend your swimming season, open your pool earlier and close it later. Your pool is always ready when you have a Raypak on duty. The Raypak has a polyester-coated, non-corrosive cabinet that is more durable than solvent-borne and waterborne-coated metal cabinets. Every piece of sheet metal goes through a 7-stage wash system, making certain the powder paint has a perfect bond. The Raypak’s undercarriage is made from galvanized metal, which offers superior rust prevention and years of durable service. This heater is designed to draft naturally in outdoor installations with its exclusive low-profile design. No fans are necessary to combat drafting problems under normal conditions. The Raypak delivers uninterrupted heating performance regardless of falling leaves, wind, airborne debris, rain, downdrafts, updrafts, sleet, snow, etc. 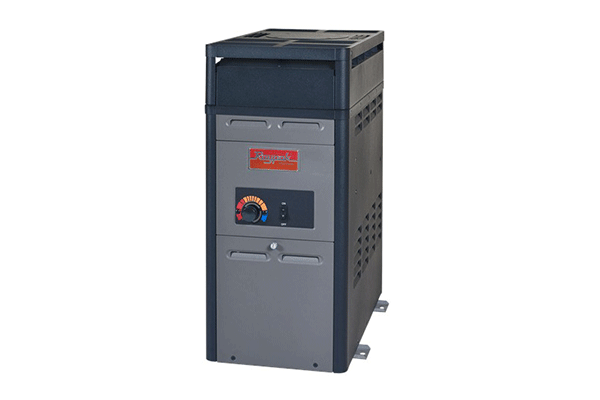 The 150,000 BTU Natural Gas Heater has polymer heads that prevent rust stains from harming your pool or spas surface; giving you years of trouble-free swimming pleasure. The fin tubes of the heat exchanger are each made from a single piece of extruded copper. This design allows maximum heat transfer to be attained and maintained. Thick stainless steel tube sheets for robust construction and rust free operation. This control handles all the safety functions of the heater and the electronic ignition and flame supervision. The electronic ignition system requires external power (120VAC or 240VAC) and generates a pilot only when there is a call for heat.